Linda Schier, Executive Director of the Acton Wakefield Watersheds Alliance (AWWA), has been awarded a 2016 Visionary Award from the Gulf of Maine Council on the Marine Environment (GOMC). The Council was created in 1989 by the governments of Maine, Massachusetts, New Brunswick, New Hampshire and Nova Scotia to foster environmental health and community well-being throughout the Gulf watershed. Linda was nominated for her exemplary work and dedication to protecting the lakes in the border region of Acton, Maine and Wakefield, New Hampshire. As the Executive Director of AWWA, Linda brings lake issues to the attention of municipalities, businesses, educational institutions, governmental agencies, residents, visitors and students. The list of Linda’s accomplishments is extensive, including projects such as initiating Weed Watcher programs, organizing water quality monitoring volunteers, hosting special interest workshops, advocating for lake protection at municipal forums, organizing educational events and river clean-ups, conducting watershed assessments, and leading hands-on school and community programs. In 2005, Linda and AWWA founded a Youth Conservation Corps (YCC) to provide summer jobs for local youth. Under Linda’s guidance, the YCC has installed over 750 stormwater management practices that prevent many pounds of sediment and phosphorus from reaching lakes, rivers and streams. She has also served as the leader for two significant watershed planning projects, one for Province Lake and another for the Salmon Falls headwaters lakes. During these projects, Linda brought diverse stakeholders together to collect and analyze watershed data and recommend specific actions for reducing pollutant load to the waters. Linda does not shy away from the technical, environmental, and social challenges inherent in lake protection work. Through her enthusiasm, curiosity and persistence, she motivates others to care about lakes, too. Her passion, creativity and deep understanding of lakes and people have earned her the respect of many. Congratulations, Linda, and many thanks for your hard work and dedication! Sally Soule (l) and Steve Couture (r), NHDES, present the GOMC Visionary Award to Linda Schier. This is truly an appropriate award for Linda. She has an insightful ability to understand people and communicate key messages to gain support for improving lake water quality. 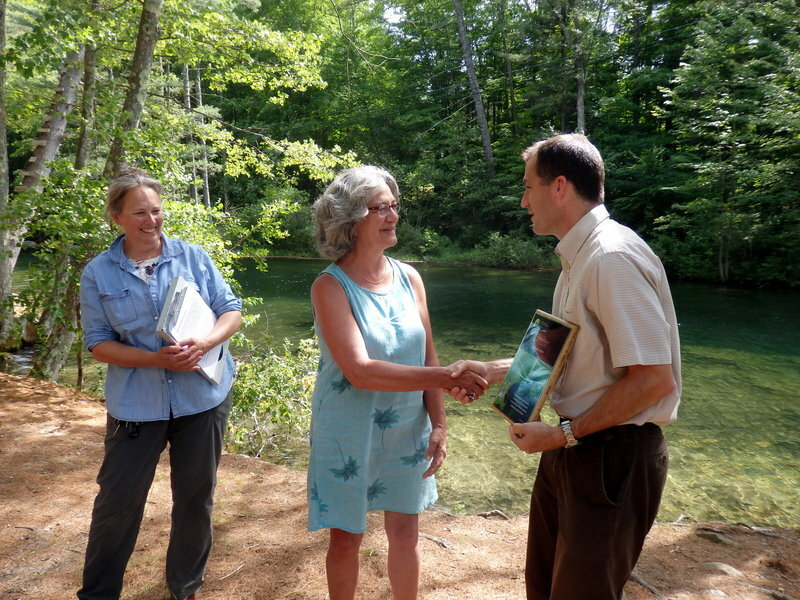 She has skillfully and passionately led and implemented so many successful initiatives protecting New Hampshire Lakes.